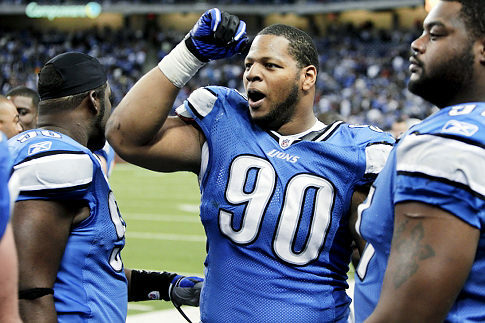 If you haven't seen the recent news about Ndamukong Suh's record $100,000 fine then take a read here. Now lets take a closer look at the NFL's decision to fine Mr. Suh and examine the hypocracy of their actions. When I think about youth althletics from the youngest to the college players that work extremely hard, wear the school uniforms and learn to trust their teamates and earn their respect, I think about values. What does it take to become great? What are the core values associated with players and teams that reach a certain level of greatness? One key trait is discipline and its cousin trait, respect. They go hand-in-hand with earning the right to wear a team or school's uniform. Atheletes wear that crest, that logo, that mascot and carry it on the field to represent not only their current teammates, the fans, the coaches and support staff, but all of those players and coaches and fans who have come before them. So when a player has a history of breaking rules, ignoring authority when being corrected and behaving like a rogue, does that player maintain the right to wear his or her uniform? My sense is that we are all human and we make mistakes. Leaders and winners learn from our mistakes and struggle every day to improve ourselves, our behaviors. Many of us are lucky to find ourselves on a great team. Some of us are athletes and many of us are on different kinds of teams, collaborating towards a common goal. The common thread that runs through all teams is a network of people operating within an agreed set of rules. Great teams and great players figure out a way to leapfrog their competition within the established boundaries of the rules of their game. Knowing all of these facts as commonly accepted principles of fair play, why does Ndamukong Suh keep getting a pass? He has a history of unacceptable behavior playing for the NFL, which bases a substantial portion of its business strategy around child fan involvement and yet they don't have the courage to throw Mr. Suh out of the game. As my 14 year old son just said, "now kids are going to want to play dirty because of him." Who's Responsible? Where to go From Here? Where does the responsibility lie? Here are my recommendations for the NFL and the Detroit Loins' respective management team in handling this player and players like him going forward. The immediate removal of all fan merchandise from any authorized reseller and manufacturer of the player's licesensed apparel or hard goods. Said player will have to pay a fine equal to or greater than the potential civil settlement value of injuring a player who could loose his ability to earn a living. 100 hours of community service for each offense. The offending player shall have to hand in their uniform in a public shaming ceremony before the kick off at their next home game. Here is the deal: you want to wear the uniform, respect the rules of the game, you want to play like an animal, go hunting.